To grow your business you will need to embrace, and be committed to becoming educated in marketing strategies and sales. Why? The bold headline above is not hype. It doesn’t matter how good your products or services are if no one is aware of them, or understands the benefit of purchasing them. The total number of potential buyers you contacted or that contacted you last year. Most business people confuse responses, or the number of potential buyers, with results. Just because the phone is ringing doesn’t mean revenues are surging. Few businesses know how many leads they get each week, or from which marketing strategy they come from. Quality of leads is important in your conversion process. You have to research your target market, craft a great message and deliver that message to your ideal prospect to ensure you have a greater chance of them becoming a customer. The percentage of people who did buy, vs. those who could have bought. 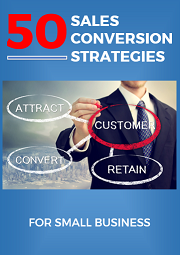 If you had 10 appointments with prospects today and you sold to only 3 of them you’d have a conversion rate of 3-out-of- 10, or 30%. Guessing your conversion rate is not acceptable. By actually measuring it you create a great opportunity to improve it. If you double your conversion rate you’ve doubled your sales without increasing leads! customer buys from you in a year. This is a gold mine as most businesses never collect a database of their past customers, let alone write to them, or call them and ask them to come back. If your average dollar value per sale is $100 then setting a target to increase it to $110 can have a huge impact to your revenue. Add up your total sales and divide it by the number of transactions to obtain this figure. This is the percentage of each and every sale that’s profit. So, if you sold services for $100 and $25 was profit, then you’ve got a 25% margin. Remember: this is after all costs are taken out. So … Your Turnover x Margins = Profit. What you can do is get higher margins on the revenues you generate. Call Brian now for a FREE Strategy Session and discover how you can grow your business.